Flat Backyard is great for games! Relax in the shady area! 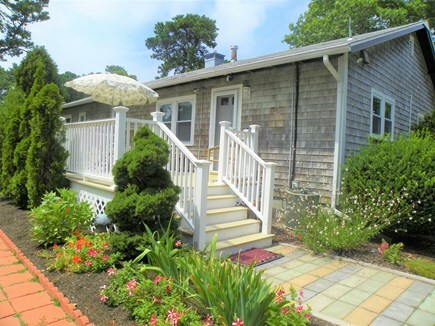 Newly renovated, spacious vacation home in South Yarmouth - minutes from beautiful Nantucket Sound beaches - warmest waters on the Cape, restaurants and attractions! Our large, sunlit, well equipped vacation home is ready for your arrival - the house is full of amenities and is suitable for either families or couples vacationing together. 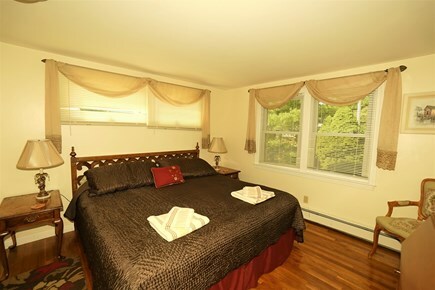 Our vacation home features a rare combination of bedrooms - there are 2 bedrooms with king size beds and 2 bedrooms with 2 twin beds, accommodating up to 8 people comfortably. 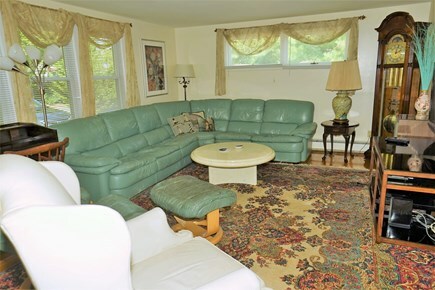 The living room with a fireplace is extra large - plenty of room to spread out for everyone. 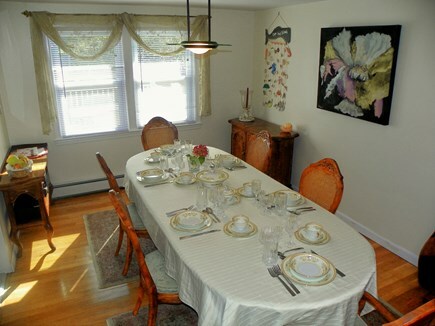 There's a sunny dining room with seating for 8, a brand new kitchen with all the modern appliances and 2 full bathrooms. The beds are made up with crisp fresh linens (high thread 100% cotton) - we supply it at no cost. The bath towels are also included free of charge. 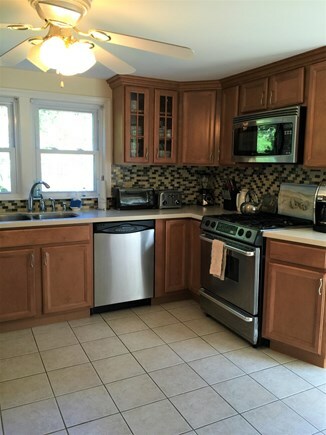 Our house is immaculately clean, with gleaming hardwood floors throughout. 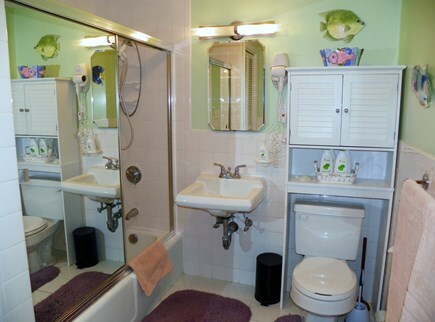 There's a Central A/C for your comfort, and the house has free Wireless High Speed Internet.There are three cable TV/DVD players, VCR, games and books. New 42'' LCD Flat screen TV set installed in the living room. 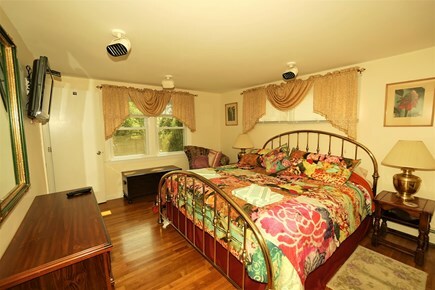 Also, there are new LCD flat screen TVs in the master bedroom and the bedroom with a king bed. 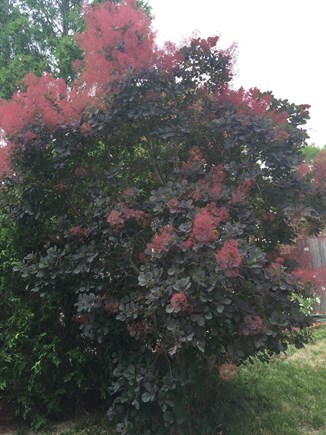 Our home is surrounded by a lush, large, partially fenced in yard with a deck and patio. The deck is set up with comfortable outdoor furniture, and there is a grill on the patio for those barbeques! The hammock under the mature trees and the garden swing will add more comfort to your stay. There's a hot/cold outdoor shower for a quick rinse after the beach. Kids love it! There's a washer and dryer, so no need to pack too much - save room for shopping! 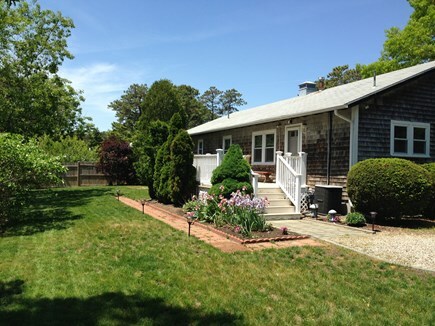 We are conveniently located on a dead-end street within 7 minute's walk to several beautiful Nantucket Sound beaches - the warmest waters on the Cape! These beaches are over 1 mile long with many recreational activities. There are lifeguards, a snack bar, restrooms, and showers on the beach. There is also a fishing pier and a boat ramp. Spend the evening enjoying the beautiful sunsets or fishing off the pier! To make your beach time more enjoyable, we provide beach towels, beach umbrellas and beach chairs. Just a quick 5 minute drive to Route 28 (or 15 minute walk) will take you to numerous restaurants, supermarkets and a variety of shops. Excitement and fun awaits for you. There are two 18-hole golf courses, Ryan Family Amusement Centre, Bonkerz Party Zone (exciting Indoor Playground), bowling, two miniature golf courses, ZooQuarium, fishing/harbor tours or shell fishing on the beach, a windmill dating back to the 1800’s with a nice water view, and a lot more within short distance of our home. The house is centrally located, so you can explore the Cape in each direction, with every town boasting artists' studios, museums, galleries and craft shops. 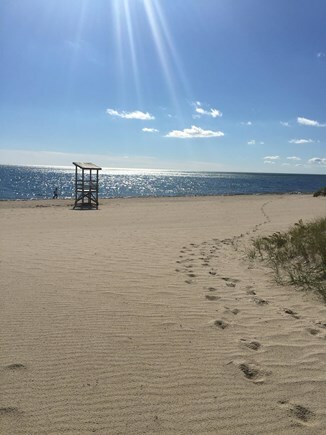 A favorite among area sight-seeing stops is the Cape Cod National Seashore--a stretch of preserved natural beach where picnicking and guided tours are offered. Departing from Hyannis is a scenic tour aboard the Cape Cod Railroad. 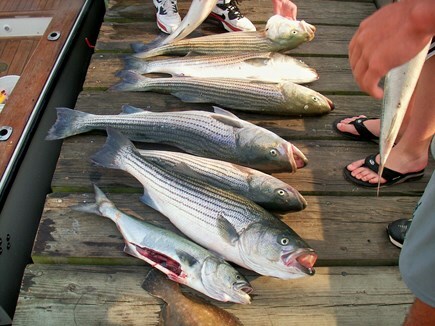 The two-hour tour passes cranberry bogs, salt marshes, the seacoast, and Cape Cod Bay and Canal. You will enjoy a tour of Cape lighthouses. There are eight working lighthouses on the Cape, mile-for-mile one of the largest concentrations of working lighthouses in the world. Catch a Duck tour, a perennial favorite with adults and kids! Between April and October, BE SURE to go on a whale-watching cruise. A leisurely bike ride through this area is perhaps the best way to see some of the most impressive seaside mansions on the Cape. We provide TWO BIKES FREE OF CHARGE. 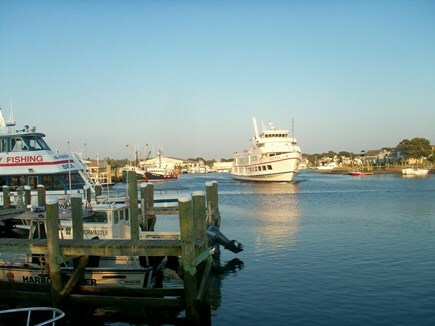 It takes you only 10 minutes to get to Hyannis Harbor and take a great day trip to Martha’s Vineyard and Nantucket. We supply our guests with such amenities as high quality bed linen, bath towels, beach towels, beach umbrellas and chairs, two bikes, paper products, soap, shampoo, shower gel, bath foam, laundry supplies, all at no extra charge. The kitchen is fully stocked. 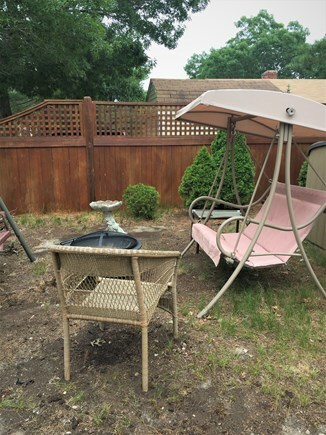 We provide tee, coffee, coffee maker, toaster, blender, cooking utensils (including pots, pans, bowls etc), iron & ironing board, hair dryer, patio furnishings, garden swing, grill and propane for the grill etc. We do consider well-behaved dogs at an additional pet fee. 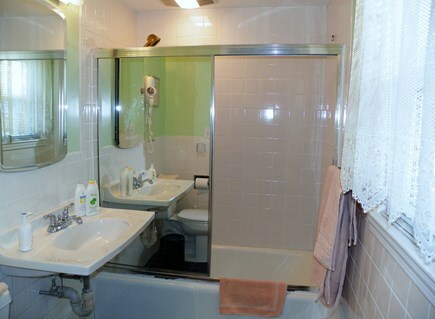 Long-Term Rental (1 month or more): available from January to May. Price is depending on party size and length of stay. Additional pricing info: Discount for multiple weeks, cleaning fee $200. State and local taxes of 14.45% will apply. 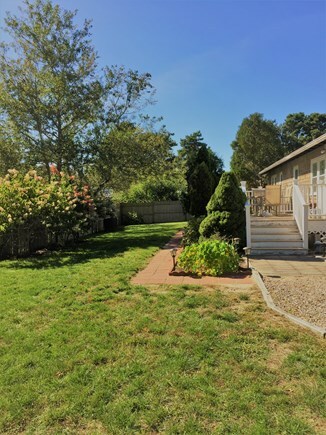 What a lovely, clean house - well groomed and maintained backyard! Friendly people all around make you feel welcome without wanting to leave, not exaggerating! Shopping plazas, restaurants - you will be alright. Beach was lovely and clean, surprisingly warm waters in September! 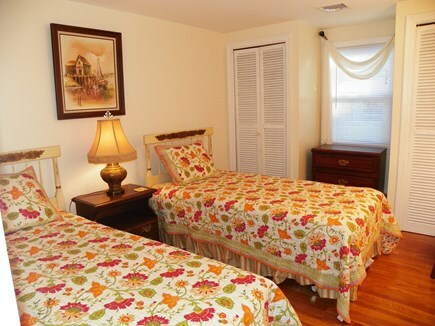 Owners are very pleasant and booking was super easy - you will love your stay! This was a perfect spot for our family to gather for a wedding in Dennis last weekend. Six adults, had plenty of space for the bit of downtime we had between festivities. Would return! We had a wonderful stay at this home. The location was near restaurants and a walk to the beach. WiFi, TV’s in rooms and industrial washer too. Everything you need to move in and enjoy! Also convenient to a wonderful dog park where we met such nice local people. Was a great home base. IT TRULY IS A GEM! This home really is a gem. We vacationed in this house for a month in 2018. Loved it so much we are returning for three weeks this year. Can't wait to get there. Owner, Alex, was more than helpful. The few times we had a question, he came right over. The house was immaculate, and all the linens were provided. That was a big help for us. Love the Yarmouth area and have vacationed here for many years. The area is central to most Cape attractions. 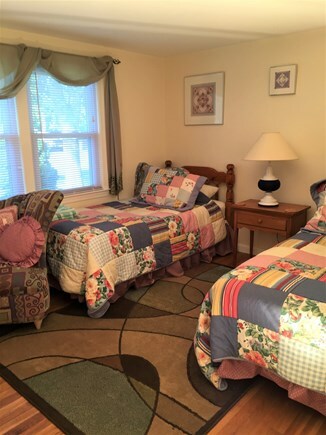 Lots of beds; great for a reunion! Enjoyed the house and how simple everything was with a group of 8. Thank you, Alex!